I:CO collaborates with Suitsupply in order to provide their customers a simple, convenient solution to promote product end-of-life responsibility. Customers of the men’s fashion brand can return their worn-out clothing and shoes in selected Suitsupply stores across the globe. These textiles are then sorted and brought to their next and ecologically most appropriate use. Items in good condition get a second life, unwearable textiles are recycled. 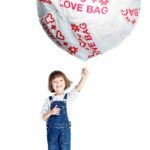 Okaïdi – Obaïbi, the French childrenswear brand for kids, launches its LOVE BAG campaign together with I:CO, the global solutions provider for the collection, sorting, reuse or recycling of textiles and footwear. Parents and children are encouraged to bring in their used clothing and shoes at all participating Okaïdi – Obaïbi and IDKIDS.COMMUNITY stores in Germany, France, Italy, Belgium, Spain, Poland and Luxemburg. On May 11, 2017, decision-makers from the global fashion industry come together in Copenhagen for the 5th Copenhagen Fashion Summit. It is the main event of the non-profit, year-round initiative called the Global Fashion Agenda (GFA). The world’s leading business forum on sustainable fashion will address the most critical issues that our industry and planet face. This year’s main theme for the Summit is “Commitment to Change”. One of the expected outcomes of the 2017 Summit is the signing of a concrete call to action pledge put forward by GFA to create a unified effort in accelerating the fashion industry’s transition to a circular system. GFA will create a toolbox for the signatories in partnership with I:CO, the global solutions provider and innovator for the collection, re-use and recycling of used clothing and shoes. I:CO serves as an exclusive partner and provides case studies and the sharing of data, insights and experiences in order to support fashion brands in implementing the commitment. Founded at the Copenhagen Fashion Summit in 2017, „Make Fashion Circular“ brings together decision-makers from the fashion industry. I:CO is proud to participate in this 3-year initiative. The goal is based on three key principles: clothes that are made to be made again, from safe and renewable materials, and business models that mean they are used for longer. From May 2017, ETERNA – together with I:CO – not only makes take-back of worn-out clothing possible but also organizes the responsible utilization of the items returned. Since 1863, the long-established German company based in Passau stands for business shirts and blouses. Before starting the campaign, some successful test runs have already been carried out in selected stores. As ETERNA customers have enthusiastically received the campaign, it will be extended to all ETERNA stores in Germany and Austria. 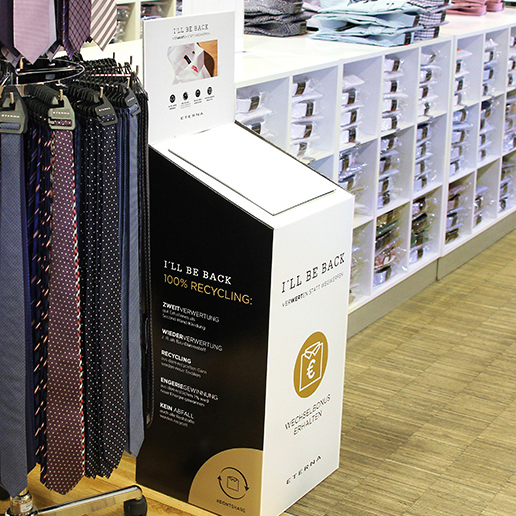 Customers who return sorted-out clothing – no matter which brand or in which condition – will receive a bonus for it. For each piece of clothing returned, customers will get a voucher worth 10 euros to be redeemed immediately or later when buying a new ETERNA shirt or ETERNA blouse. For the moment, the campaign is calculated for a period of six months. 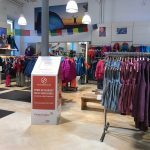 Good news for outdoor and globetrotter fans: Following February 2017, they will be able to hand in worn textiles and footwear at all branches of the leading outdoor and travel equipment supplier in Germany. 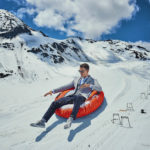 This is how Globetrotter Ausrüstung GmbH is expanding its commitment to sustainability, while at the same time providing the basis for a closed cycle of recyclable material. With a first branch for expeditions, safaris, survival and trekking, the founders as well as survival experts Klaus Denart and Peter Lechhart hit the ground running in Hamburg as early as 1979. Today Globetrotter is represented by branches in Hamburg, Berlin, Dresden, Frankfurt, Cologne, Munich, Stuttgart and Ulm, as well as by outlet stores in Bonn and Metzingen. From today on, Globetrotter will accept disused clothing and shoes from their clients. Thus, hiking, trekking or winter boots, socks, jackets, ski pants and much more can be brought to their optimal purpose. The new Garment Collection campaign “Bring It” will debut globally on January 26 at hm.com. The goal of the campaign is to spread awareness on the importance of garment recycling. In order to reach this goal, a brand new film directed by Chrystal Moselle will kick-off the Garment Collecting campaign “Bring It”. Since 2013, H&M has run its worldwide Garment Collecting initiative and has collected over 40,000 tonnes of clothing. Customers can bring any unwanted clothing from any brand and in any condition to all H&M stores year-round. H&M aims to advance the amount of clothing collected every year in order to attain a total collected volume of 25,000 tonnes annually by 2020.